After falling for each other over pizza while in college, Jillian and Evan carved out a life for themselves in Chicago—spending their Sundays hopping from one trendy restaurant to the next and taking long walks along the 606. Fittingly, Evan proposed to Jillian while the couple was on an evening stroll near the river, and after 7 years of being together the couple has finally tied the knot. The bride kicked off the big day in the early afternoon by heading to a blow dry bar with her bridesmaids. There they individually picked hairstyles, and all decided on beautiful braids for the ceremony. 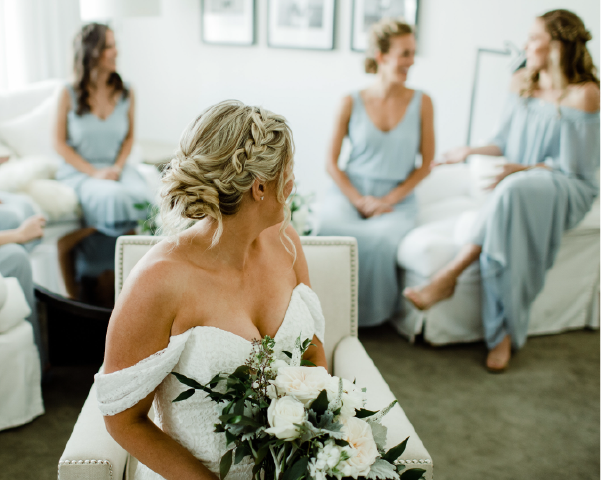 The twisted tendrils paired gorgeously with their powder blue dresses—and helped to tie each individual style together. 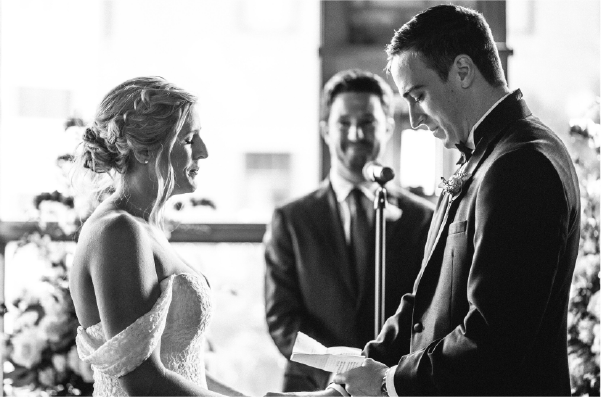 The couple chose to have both their ceremony and reception at a brewery, a favorite neighborhood spot perfectly fitted to bring their friends together in a space that felt like home. The décor was kept understated, only accenting the classic Chicago-style building’s exposed brick and dark woods with sprigs of baby’s breath. Instead of a traditional altar, the couple was married between two bourbon barrels cascading with the beautiful white flowers. The couple's childhood photos were strung throughout the venue, visible as guests made their way on brewery tours during the cocktail hour. Both of Jillian’s parents walked her down the aisle to “She Lit a Fire” by Lord Huron. The song usually has the power to bring her to tears on its own, and it was epically touching in that moment. After the couple met in an ivy-covered side street, both their nerves faded away. They exchanged tears and embraced—then the real party kicked off. Keeping with the day’s laid-back approach, the couple chose a casual reception with no assigned seats to encourage their guests to mingle around the room and get to know both sides of the family. 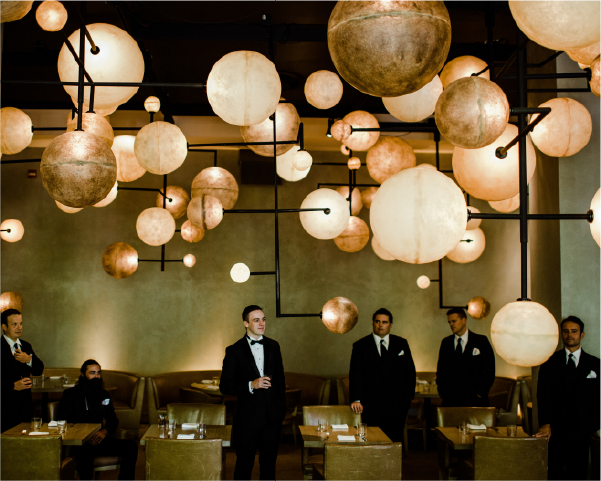 An Instax camera was placed in the reception and cocktail area, allowing guests to snap fun pictures of the newlyweds together with their new family and old friends. Guests then taped the snapshots into a scrapbook-style guest book, a sweet keepsake of the day. 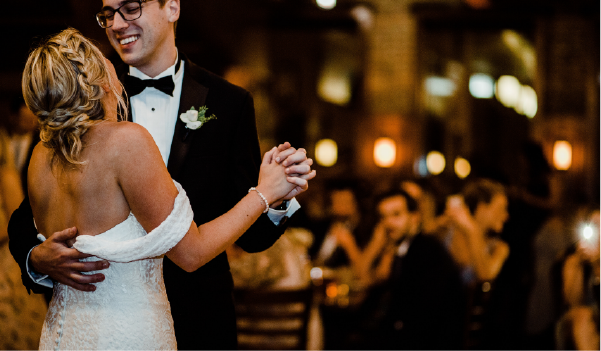 Evan and Jillian's first dance was to “Coming Home” by Leon Bridges, chosen to celebrate finally being married and feeling completely at home with each other. The couple then cut their small, elegant cake topped simply with two kissing “love birds”—guests were free to nibble on dessert table stocked with treats from one of their favorite bakeries while dancing the night away.